CarGurus has 40,813 nationwide Traverse listings starting at $2,500. Say you’ve got a bunch of people or a ton of stuff to haul around, but a jumbo-size sport ute’s just too big. Check out Chevrolet’s 2016 Traverse full-size crossover. With 3 rows of seating for 7 passengers, 116.3 cubic feet of cargo room (with the rear seatbacks folded), V6 power, and all kinds of creature comforts, this right-size Chevy won’t strain the gas budget, and it’ll still fit in the garage. Available once again in 3 trims—the base LS, the well-equipped LT, and the flagship LTZ—the 2016 Traverse further subdivides the LTs into the less perk-packing 1LT and the even more up-featured 2LT. Furthermore, while all trims are delivered with standard front-wheel drive (FWD), each remains eligible for an available full-time all-wheel-drive (AWD) configuration for those tough northern winters. A slew of hints from both Chevrolet and the automotive media indicate that a comprehensive redesign for the next-gen 2017 Traverse is in the works, but that often means a next-gen price tag. However, the 2016 edition does tote a few changes, including some tweaks to the OnStar Directions & Connections service with 2015’s debuting 4G LTE MyLink WiFi-capable technology, a couple of new exterior colors, and upgrades to the LTZ’s standard 20-inch alloy wheels. Additionally, a new Leather & Driver Confidence package, boasting blind-spot warnings and a rear cross-traffic alert, as well as heated, power-folding outside mirrors with a driver’s-side auto-dimming function, will be offered as an option on the 2LT iteration. The 3.6-liter V6 powerplant returns to the 2016 Traverse lineup and mates with the ubiquitous 6-speed shiftable automatic transmission to put out 281 hp and 266 lb-ft of torque in the LS and LT variants. Again, those who select the LTZ, with its dual-exhaust setup, get an extra 7 hp and 4 lb-ft of torque from this same drivetrain. Look for estimated mileage numbers to return at 17 mpg city/24 highway/19 combined in the FWD trims, with AWD iterations returning an estimated 16/23/19. Expect the entry-level Traverse LS to return boasting 17-inch steel wheels and a rear spoiler for 2016, while the LT trims again up the ante with 18-inch alloy wheels, and the LTZ sports upgraded-for-2016 20-inch alloy wheels, heated reverse-tilt mirrors, and a power rear liftgate. 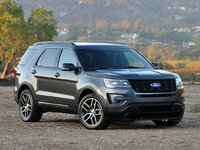 Inside, expect this hefty crossover, in specific trim variations, to remain toting cloth or leather upholstery, reclining rear seats, heated power-adjustable front seats, and full power accessories. Cruise control and telescoping tilt-wheel steering also return for the upcoming model year, as does a rear-view camera for all trims. Furthermore, look for higher trims to tack rear parking sensors and a remote garage door opener to the list of standard features, while 3-zone automatic climate control replaces the LS trim’s standard manual air conditioning. Meanwhile, the LTZ also throws a heated steering wheel and memory for driver's settings onto the pile of standard features. Again for 2016, all Traverse variations are slated to return with standard OnStar/Bluetooth Directions & Connections technology, with upper-echelon trims toting the aforementioned upgraded MyLink system boasting 2015’s integrated 4G LTE WiFi capability. All trims also remain sporting the standard 6.5-inch infotainment display, while the LTZ goes a step further in offering standard GPS navigation interfaced with the MyLink system. Entertainment in the base LS and its LT1 sibling is expected to remain a single CD/MP3 player with 6 speakers, satellite radio, and an auxiliary audio input. The LT2 and the top-shelf LTZ, meantime, are scheduled to carry the standard Bose premium audio system with 10 speakers into the upcoming model year. Again, lower Traverse trims will remain eligible for available add-ons that come standard with the higher trims, while the abovementioned 2LT’s Leather & Driver Confidence package is slated as the single noteworthy new option offering. Further trim-specific available equipment slated to remain in the 2016 editions includes a power sunroof, rear-seat DVD entertainment, a roof rack, a trailer hitch and wiring, and, in the 2LT only, second-row bench seats to offer seating for 8 passengers. Standard safety stuff in all 2016 Traverse variations is expected to include 4-wheel antilock brakes (ABS), traction and stability control, front side-mounted airbags, 3-row head airbags, and GM’s exclusive center-mounted front airbag that’ll keep the driver and front-seat passenger from smacking together in a side collision. Again, all trims will return with standard OnStar emergency alerts and communications, daytime running lights, a post-collision safety system, and a remote antitheft alarm as well. Additionally, both LT iterations as well as the LTZ will also remain delivered with standard turn-signal-integrated mirrors for the upcoming year. Finally, the LTZ will return boasting a standard blind-spot warning and rear cross-traffic alert that, as noted, is slated to become part of the LT2’s Leather & Driver Confidence package debuting in the upcoming year. The current Traverse, by the way, gets high marks for overall safety from both the National Highway Transportation Safety Administration (NHTSA) and the Insurance Institute for Highway Safety (IIHS). Owners have complained that the third-row seat in the 2015 Traverse is suitable only for children, while others note a disappointing lack of power and some unimpressive real-world mileage returns from the V6. On the plus side, this hefty Chevy crossover is lauded by current owners for its ride comfort and family-oriented value. Look for the 2016 Traverse to go on sale in the fall of 2015 when it will again challenge such traditional competitors as Toyota’s well-wrought Highlander, Mazda’s sporty-but-small CX-9, and Ford’s stylish Flex. 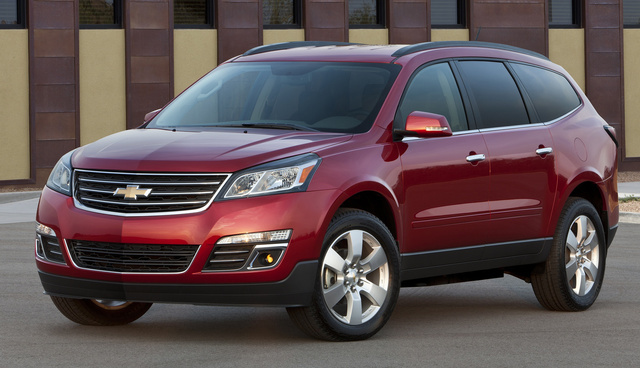 What's your take on the 2016 Chevrolet Traverse? Marilyn1949 My 2016 LTZ Traverse has an infotainment system glitch. I downloaded my music from Microsoft Media Player to several brands of flash drives. None work. The system freezes and shuts down. These same flash drives work in a 2015/2016 Tahoe and 2016 Silverado. They also work in 2015/2016 Nissans. I was told by my dealership that their flash drive works. Originally I was told that their flash drive had iTunes on it and later LimeWire music. I have been in GM chat sessions only to come to a dead end because the Service Manager at Rountree-Moore in Lake City Florida claims there is nothing wrong with my Traverse's infotainment system. I went to an Apple store and the tech tested her iPhone. It wanted to download an APP and have me sign in while attached to the USB drive in my Traverse. I seriously think my Traverse has Apple CarPlay but no one will admit to this. I tried my flash drives on 2015/2016 Traverses also with the same results as with mine. I hope that I will not be forced to purchase Apple products to enjoy my infotainment system. 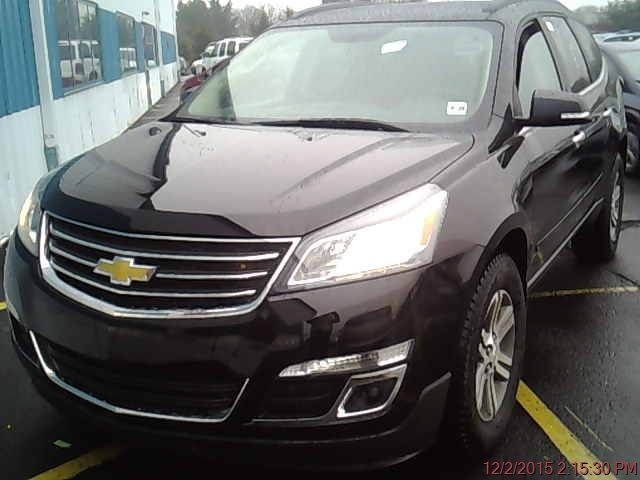 Have you driven a 2016 Chevrolet Traverse?